Called to the principal’s office . . .
On Thursday I got in trouble for the first time in my teaching career (it took less than two months – go me). The short story is that I cancelled a class and the student complained to BTL (my school). If you want the long story, read on. On Thursday August 19th, I discovered that I would have to go to London for an afternoon (for reasons that shall remain undisclosed for the time being). On my calendar, the most suitable day was Tuesday the 24th, as I had a class at 9:00-10:30, and another at 4:30-6:00. I asked a couple of girls in the teachers’ room about cancelling classes, and they assured me that most students didn’t mind rescheduling. I was taking over a cycle from another teacher who had already had five lessons with this student. The previous teacher’s notes had said that the book the student had was Market Leader Intermediate, but the notes covering what she’d done in the lessons all referred to units taken from other books, so I didn’t know where she was up to. I planned a lesson around a unit on Ethics. As this was unit 11, I figured I would be fine. 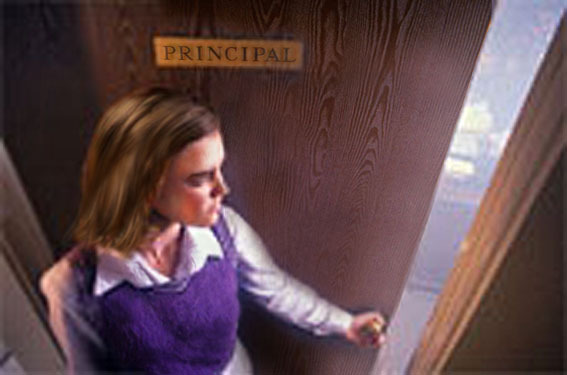 The student, Kate, arrived for her class thirty minutes late. I introduced myself and, when I took out the Ethics unit, she complained that she had already done it with Timothy (one of her former teachers) on a previous cycle the year before. I apologised and explained that I only had the notes from the current cycle, which said that the teacher hadn’t used this book. “Oh, but Timothy was English,” she said. She then asked me how long my visa was valid. “I’m not sure . . .” I said. 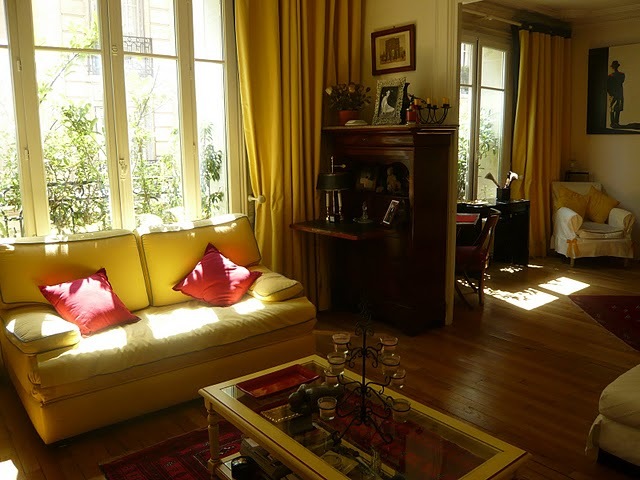 Regular readers will know that Paris has been a little bit of a struggle, so I still haven’t decided whether I’ll stay here for the whole year, and I didn’t want to lie to Kate. Moral of the story – always lie! I then had the nerve to ask which chapter in the book Kate was up to, and she sighed and said that I should have had the notes from the previous cycle. “Okay, let’s do some listening then,” I changed the subject and we spent the rest of the lesson listening to and discussing The Ethicist podcasts. By the end of the lesson she seemed much perkier, so this was when I dropped the bombshell – I needed to reschedule Tuesday’s lesson. “It’s my fault, not BTL’s,” I said, and explained that I hadn’t put the trip to London in my calendar, so BTL didn’t know. As she was going away for the second half of the next week, I gave her the times I was free on Friday and Monday, as well as my phone number. She took it and, although she didn’t look happy with the situation, she seemed to have accepted it. I returned to the teachers’ room and sent her an email confirming my availabilities. Problem solved – or so I thought. On Friday night she emailed back saying that the times weren’t convenient for her, so I figured we’d just push the class to the end of her cycle. On Tuesday, I had a call from Lisa at BTL when I was on my way to Gare du Nord confirming whether I’d cancelled Kate’s class, as I’d left it in my calendar. I said yes, and that I was unavailable for the rest of the day. 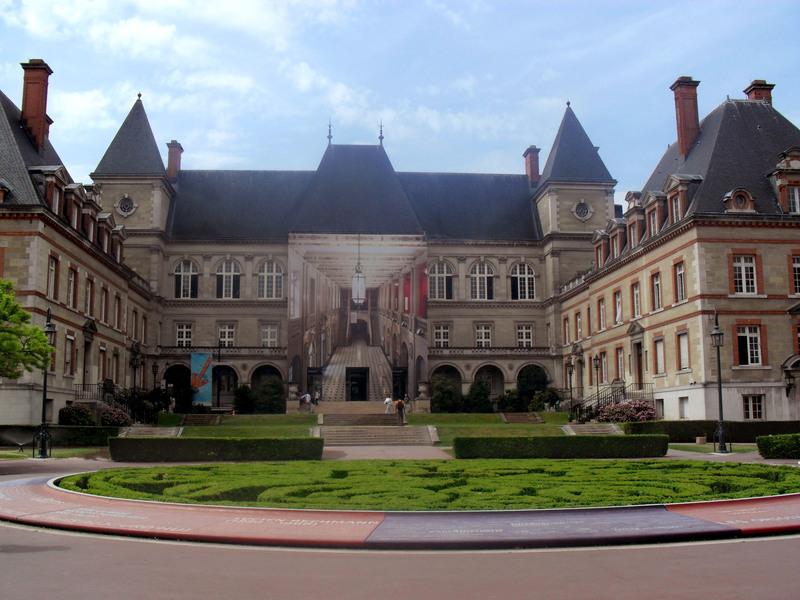 The trip to London went smoothly – the only hitch was that my (dying) phone refused to make or send calls – and I did everything I needed to do before I reluctantly returned to Paris. I’d completely forgotten. Generally the planning department puts new classes into our calendars and I’d forgotten to chase this one up when it hadn’t appeared. I then opened my work email and had a meeting request from Renée, the pedagogical coordinator, for Thursday morning regarding feedback on a conversation that I had with Kate, the student whose class I cancelled. Oh crap, I’m getting fired, I thought before I settled down for a poor night’s sleep. One of the things?! I balked inwardly – what else had I done? “So why don’t you tell me about what happened on Thursday’s class from your point-of-view?” Renée asked, her pen at the ready. I told Renée about how I’d made the mistake of preparing a chapter that Timothy had already done with Kate, and then opened her file to show that there was no record of this. I then said that when I’d asked Kate where she was up to in the book, she complained about how disorganised BTL was. I said that we’d had a listening lesson using podcasts after she’d finished letting off steam, and that I thought it had gone well from that point. Renée told me that Kate had complained about me being unprepared and disorganised, but that I’d explained that, and said that Kate had said that I was unclear about whether my visa was running out soon, and that I’d implied that I might be leaving BTL. I admitted that I’d been surprised about the visa question and had responded vaguely, but I didn’t say anything about leaving BTL. Renée then started being very mother-like towards me – Renée has always been lovely, but I was expecting a stern talking-to, and this unexpected kindness caused me to tear up a little bit. Renée told me that BTL often offers interest-free loans to teachers and said that they could help me with a deposit, and she also said that if I was desperate at the end of the month that she had a room I could rent for a week or two. I think my situation may have stopped her from being as harsh on me as she would have been otherwise – she didn’t even mention the intensive class that I missed, or the fact that I hadn’t been answering my phone on Tuesday. She then reminded me that I had to book holiday leave through the official process – even if it was just for half a day – as then BTL would be able to cover classes, or make judgements about which students could be rescheduled. My judgement was off – BTL had to give Kate free lessons and a new teacher in compensation. I must say I’m a little relieved about her getting a new teacher – I think out next lesson would have been a little awkward. So, from now on I’m going to be a very good girl and will follow the official process any time I want to do anything slightly out of the ordinary – then maybe I’ll reclaim the brownie points that I’ve lost. 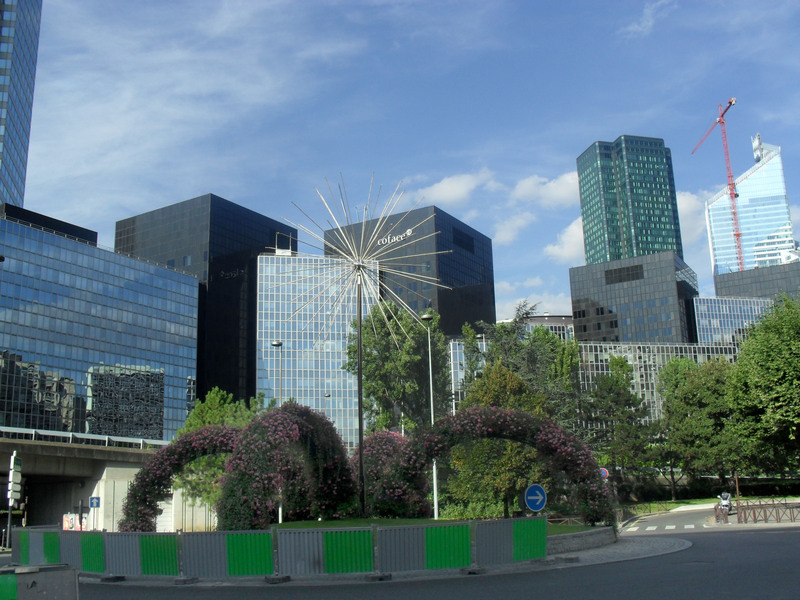 I love La Défense. I know it sounds strange because it’s not actually a tourist area, but I do. 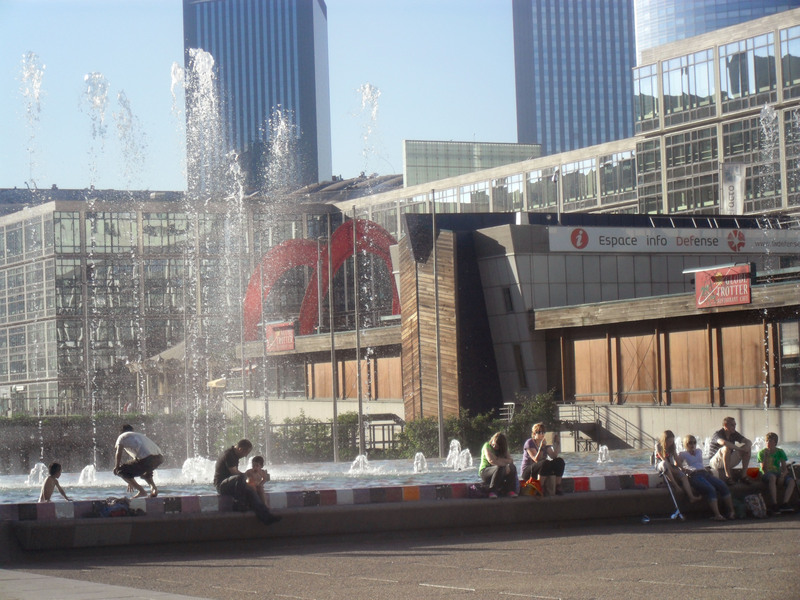 Although I miss the space of home, I’m a city girl at heart, and La Défense is one of my escapes from Paris. Standing over the metro Esplanade La Défense I can see the Arch de Triomphe and the Eiffel Tower when I look towards Paris. 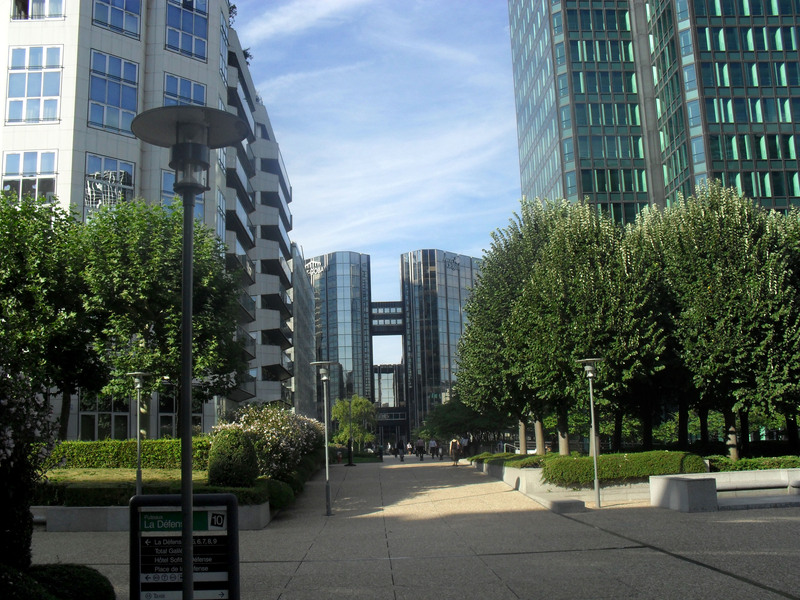 When I turn around, it’s a futuristic maze of shiny glass and metal towers surrounding huge pedestrian areas and courtyards framed by trees, shrubs and park benches, with Grande Arche de La Défense as its focal point. Yesterday, it was incredibly calm and serene. I went to a class in the neighbouring area of Puteaux and the entire region was like a ghost town – it was the first time I’d been back since my two Société Générale students went on holidays. What I hadn’t realised was that the rest of white-collar Paris had gone with them. After yesterday’s class I sat on a step near a fountain and let the breeze ruffle my hair and my skirt, feeling safe in my sense of anonymity – something that you can only really achieve in a city (yes, I’m aware that Paris is a city, but each arrondissement is like a little village – I already have a following in mine). Jazz music washed over my stone steps and I watched kids wading in the fountain, ignoring the ‘no swimming’ signs – if I hadn’t had been wearing a skirt, I might have joined them. It was very tempting, at the fountains were stunning in the afternoon light – when each stream of water hit its peak, it broke into crystal-like fragments and crashed back down to the pool. 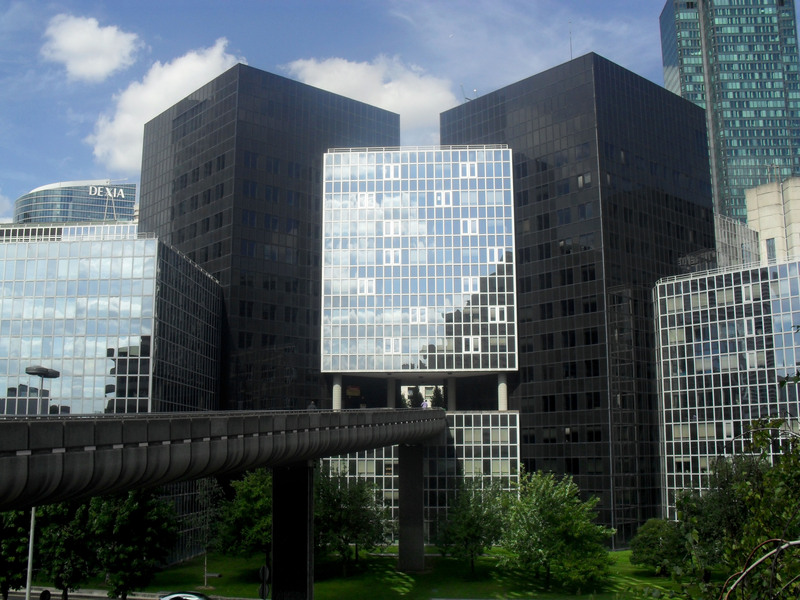 I usually like La Défense because it is filled with business people and I can pretend that I’m one of them in my power suits (we’ll ignore the fact that I burned one of these suits with the iron, and I have to balance my bag over the now-shiny material until I sit on it). But yesterday, being there when it was so peaceful, I started to think of what it would be like to live in one of the white apartment buildings in Puteaux, and to have a career in one of these towers. As I watched the clouds turn pink and the shadows lengthen over the courtyards, my heart filled with love for this amazing city. Yes, you read correctly. My French is, in fact, a snail. It is progressing at a glacial pace, leaving a silver ribbon of rolled-eyes, confusion and snickers in its wake. But the speed of my progress wasn’t what gave birth to this metaphor. My French has been getting better, and I’ve been getting more confident, due to the Conversation Exchanges I’ve been doing. However, I didn’t realise how fragile this confidence was. 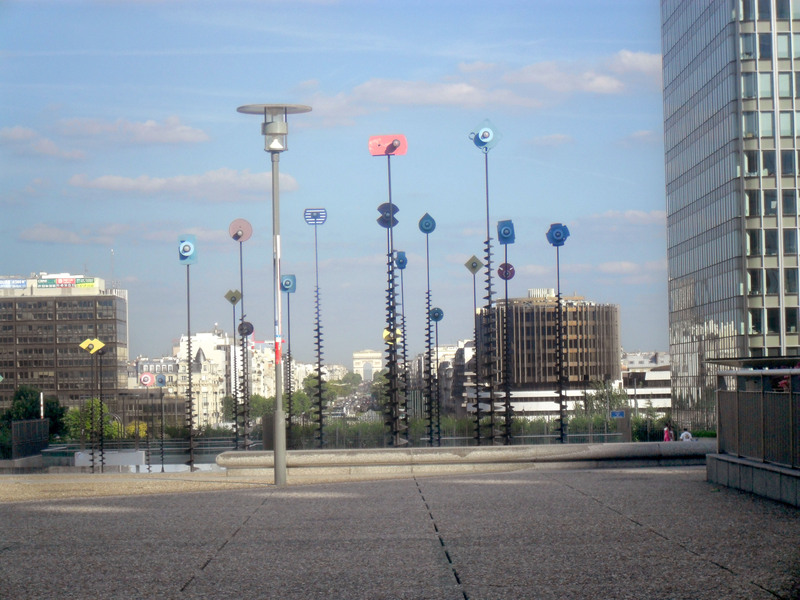 Last weekend I was leaving La Villette to look at a room to rent. As I was walking to the metro, a man interrupted me. After some pleasantries, I told him that I needed to leave to see the room, but he insisted that I stay and tell him about Melbourne and Australia, how my homeland is different to Paris, whether I like Paris, etc. This would have been fine – he seemed nice and it was an opportunity for me to practice my French. However, he continuously corrected me. He would repeat every sentence in the way I should have said it, and I eventually left feeling as though my French was terrible and I’d been getting nowhere. Don’t get me wrong – I’m a big fan of constructive criticism. But by constantly bombarding me he basically poked the escargot that is my French with a fork, and it has retreated back under its shell. Now I’m trying to be very gentle, so that I might coax it to venture out again and continue its slow trail through poorly conjugated verbs and adjectives that don’t agree with their nouns. I know, I know – I recently did a couple of posts about a week in my life. However, I have been persuaded to risk repeating myself for a great, selfless and noble cause.
. . . okay, maybe it’s not so noble. And it’s definitely not selfless. But I still think it’s pretty great – by writing about a day in my TEFL life, I can win a two-week holiday! Rate my post here. Just highlight and select the stars at the bottom of the page. I wake up at 7:30 – strangely, always one minute before my alarm goes off – and get ready for my day. At the moment breakfast is a bowl of cereal, but when I’m a little richer I might splash out on daily croissants. At 8:15 I leave and take the metro (lines 12, 4 and 5) to Gare d’Austerlitz. From here it’s a five-minute walk to my first class. Having three people, this is usually my largest class. However, the two ladies are on holidays so I only have Olivier – I’m guessing he’s in his late 30s, but he still has the approval-seeking mannerisms of a school boy. Last week I asked, since he would be on his own, what he would like to work on. The Ethicist is a podcast of letters written to the New York Times asking questions about moral dilemmas, and their replies. Tracks are generally under five minutes and contain 2-3 letters ad responses. These are great for class because they can lead onto debates after the comprehension questions (so, was it a good idea? Was it right? What would you do in this situation), and can also spin-off into letter-writing exercises. This podcast discusses front-page stories, so we get to talk about news, and the episodes are quite short. This is advantageous because anything over about 4 minutes is too long for the students to digest. So Olivier and I discussed three ethicist letters, an NPR podcast on US employment statistics, and a 5 min excerpt from a Cambridge Conference podcast on ‘Becoming Barbie’. Issues related to female stereotypes and beauty have always interested me, but I’m a bit worried about how Olivier, being a man, will react to an audio activity that mentions both breast and bottom augmentation. However, I reason that if I’m interested in a topic, it will be more interesting for the students, and my reasoning proves correct! He answers the questions I set, takes nearly two pages of notes and we have a great conversation about beauty, plastic surgery and feminism. Admittedly, I was only able to do this activity because he has a very high level of English, but I think some intermediate students (even strong pre-intermediate listeners) could cope with The Ethicist and NPR. My next student is on holidays, so I walk to Gare de Lyon and take the metro (line 14) to Saint Lazare, then walk to a replacement class on Rue d’Astorg. The receptionists direct me to the fourth floor and, when I leave the elevator, there is a gorgeous man waiting for me. 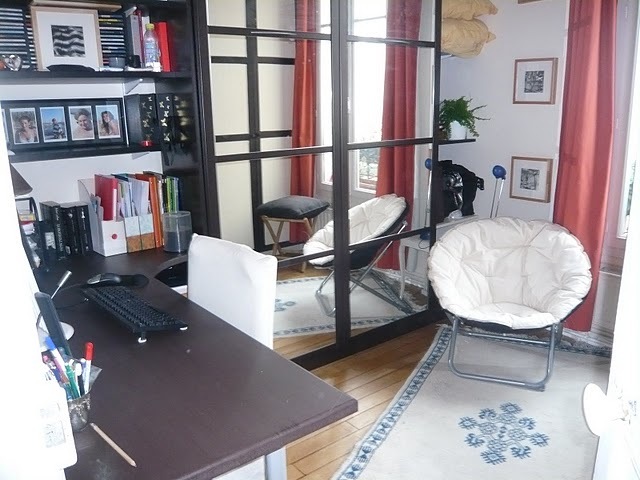 He introduces himself as Guillaume and takes me to the meeting room where our class is booked. As we do the getting-to-know you activity (a page in my notebook filled with circles, each saying a word about me – students need to guess the significance of each word, which makes it great for practising questions), I realise that he has eyes just like Eric Bana (swoon!). Miraculously, I don’t offer myself to him on the conference table and we get to work. The lesson follows a unit from his course book (In Company, Upper-Intermediate) on Information and Media. As a rule, I find lessons that just follow the book can be a bit of a bore, but this is a topic we’re both interested in, and the listening activities (which list several surprising facts behind newspaper headlines) provide ample material for discussion. Afterwards I take the metro from Saint Augustin to Grands Boulevards (line 9), and plan to quickly by a sandwich before my 1:30 class. There’s a wonderful blue boulangerie on Rue Montmartre that makes the most heavenly sandwiches – I almost which I had class in this area every day so I could eat more of them! The bread is lovely and soft with a divinely crunchy crust . . . but my hunger is not to be sated! I walk past the little boulangerie and it is closed, with a steel door rolled down over the windows. I desperately pray that this is temporary. This is my least favourite class of the week. There are two students, Samya and Florence, but generally I only have them one at a time due to holiday and work commitments. Samya is lovely and talkative, and we get along really well. Florence is also lovely, but I don’t think she likes me much. In two of our classes she has been close to tears of frustration over the work, and she frequently snaps when she doesn’t understand something, and then rushes through everything afterwards. Even when I do lessons around topics that she has said interest her, we still don’t seem to build a rapport. Surprisingly, today ends up being our best lesson so far. We start with half-an-hour of ‘have you ever’ (a card game with questions that begin with ‘have you ever’ on each card) before checking her homework on modal verbs and doing a section from her course book (Market Leader Pre-Intermediate) on negotiating. We try a negotiating role play, but she starts to get frustrated, so I ask whether she would prefer to do some listening, or some vocab. She chooses listening and I play a podcast about stress and holidays – after she easily does the comprehension questions, we talk about the two-week holiday she is going on next week. Next I’m back on the metro (line 9) and I travel from Grands Boulevards to Havre-Caumartin. I arrive at my school’s office at 3:20, which gives me plenty of time to plan Wednesday’s class before my 4:00 lesson. Yes – you read correctly. Wednesday’s class. Singular. 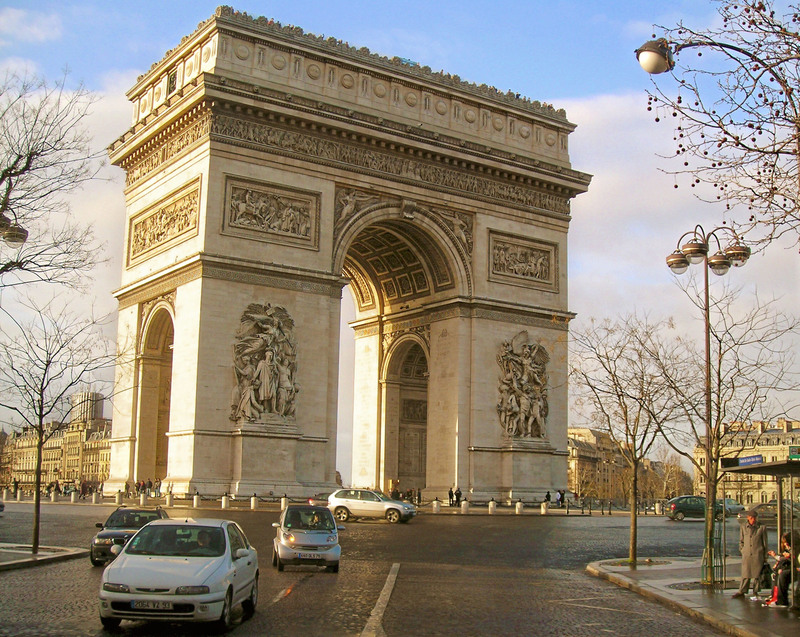 Being August, many Parisians are away, including many of my students, so things can be quite slow. My final class of the day is with Magali, who works for Medecins du Monde, which means she has seen many incredible places and has many stories to tell. After a vocab quiz, a homework check and doing a few pages from a unit on Selling Online (Market Leader, Pre-Intermediate), we play ‘have you ever’ and have a great time talking about all of the things she has seen and done and tasted (some interesting dishes include caterpillar and some sort of flying marsupial!). So on a Tuesday I start at 9:00 and finish at 5:30. As I only get paid for my teaching hours, I get six hours of pay for the day. That’s right – no paid preparation or travel time (though I do get partially reimbursed for my public transport costs). Based on the other interviews I had in June, this seems to be fairly standard and, as this is my first position, I didn’t have the leverage to negotiate a high hourly rate. Being rather poor at the moment, I meet up with a friend after work for a walk around the 14th arrondissement and a late dinner of spaghetti with salmon. I wasn’t literally expecting plain spaghetti with a piece of smoked salmon tossed on the top, but I’m not one to complain about a free meal. There were two reasons behind me starting a blog. The first was that I always send ridiculously long emails about my travels and have no idea who actually reads them, so now people can just check the blog if they’re interested. 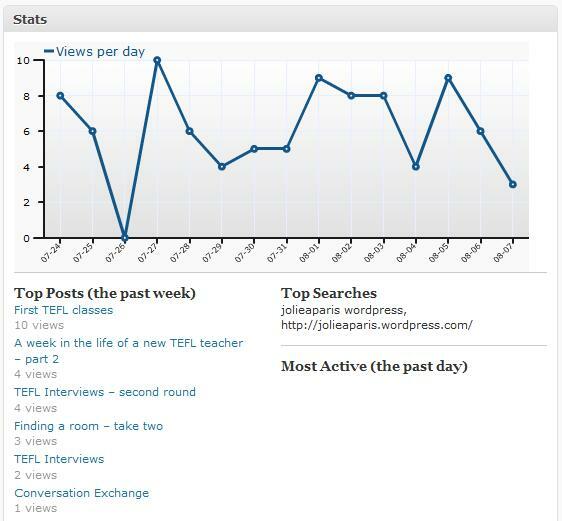 The second was that I was looking for a similar blog when I first decided to do my TEFL course – one from the point of view of a brand new teacher getting his/her first job and starting a life in a new country (when I put it like that, I’m not sure that I’m doing the concept justice . . .) – and I couldn’t find anything. There were plenty of TEFL blogs, but I couldn’t what I wanted, so I figured that my blog might be able to help people who were in my position. What I didn’t realise, was that blogging has a darker side. It’s something that I never had to deal with when emailing. On the admin site for my blog, there is a graph that shows how many people are visiting my site every day (so far my highest is 10 hits in a day – how popular am I? :p ) and which posts have had the most views. This would be fine if I were a normal person. However, I’m afraid that’s not the case. I can get slightly obsessive. The first thing I check when I turn on my computer in the morning is my WordPress stats. When I get home from work, the first thing I check is my WordPress stats. Whenever I’m using my computer, I have one tab reserved for my admin page, and I refresh it at regular intervals to see if someone else has looked at my page. The only things more aggravating than the 10 hit ceiling I can’t seem to break (what more do they want from me?! ), are the low points on the graph. I like that the graph has had an incline over the past month or so, so if I have a day that has less than five hits, I worry about how this will affect my average. When I sent emails, I would send one every month or so about interesting places I’d seen, and occasionally about the strange things that had happened in my life. When nothing was happening, the emails would stop until life got interesting again. 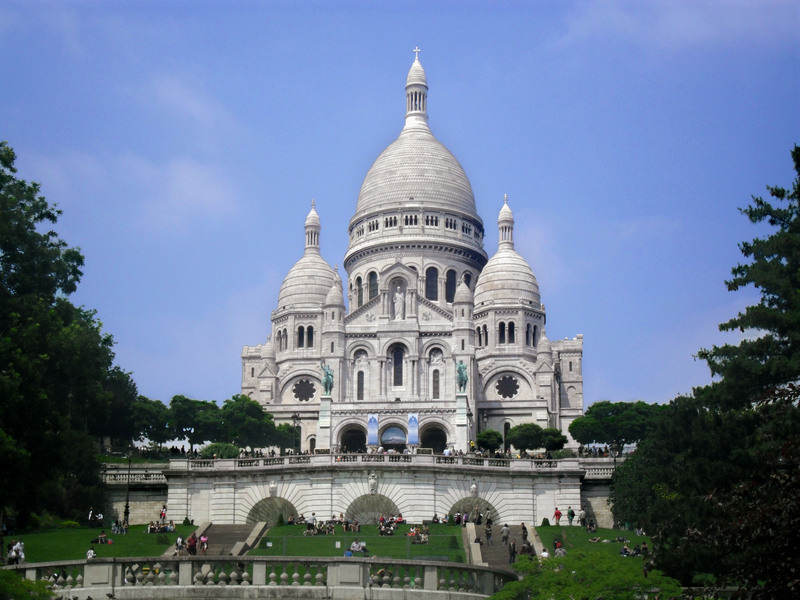 Now that I’m blogging, I’ve easily been doing one or two posts a week, because I’ve had so much to do in Paris. Until today. It’s been a slow week. And although I’ve been an active participant in my life, I haven’t done enough of any one thing to write a post about a single topic. If I was emailing, I would wait until something happened and write about that. But now I have WordPress stats, and I’ve only had three views today! So I had to write something, even if it is the last 497 words of inane babble. For those of you who wonder why I don’t do Facebook – this is why.